DUE TO SERIOUS HEALTH ISSUES, I WILL NOT BE OFFERING CLASSES OR WORKSHOP FOR A WHILE. Please check back periodically, and meanwhile see my blog for healing process reports. If you’d like to be on my email list for early notification about my classes and workshops, please contact me. I will never sell or share your contact information, and will delete your name from the list upon request. Apologies — will re-schedule soon. Please plan to attend the first session, and all sessions thereafter if possible. Lessons are sequential; each builds on the previous session. To sign up, stop by the circulation desk at Your Home Public Library, 107 Main Street, Johnson City, NY or contact Natassia Enright at YHPL, 607 797-4816 / jc.natassia@4cls.org. The focus of this course is on learning to SEE like an artist. Learn exciting skills and techniques for drawing what you actually see, rather than what you know, in a fun and informative setting. Students at all levels of experience are welcome. Please plan to attend the first session, and all sessions thereafter if possible. Lessons are sequential; each builds on the previous. The Library provides drawing materials for this class. October 1, 2016, 10:30 a.m.-2:30 p.m. Many of us use photographs as references and sources for painting and drawing subjects. The trick is to not be a slave to your photo/s, but to make them work for you as guides rather than goals. We’ll discuss various methods of evaluating and editing photos using paper and scissors, tracing paper, and computer applications such as Photoshop, and get some hands-on practice with the computerless methods. The instructor will provide sample photos, and you may bring your own photos; please bring 3 or more color photocopies of each (not the original prints), at least 5 x 7” in size. Please bring drawing paper, a sheet of graph paper, a 12” ruler, scissors, a glue stick, crayons or colored pencils (all available at dollar stores), and tracing paper. Bring a bag lunch as well — we’ll be taking a short lunch break. These methods are useful for artwork in all media, but we will not be producing finished works of art in the workshop – leave your paints, pastels, etc. at home, then use them to better effect after this learning session. Classes are on Mondays, April 25 through May 23. Please plan to attend the first session, and all sessions thereafter if possible. Lessons are sequential; each builds on the previous. To sign up, stop by the circulation desk at Your Home Public Library, 107 Main Street, Johnson City, NY. Contact YHPL — 607 797-4816 / jc.natassia@4cls.org — for sign-up information, or contact me with questions or for information about class content. The second-floor class space is beautiful, but due to the historic nature of the building there is no elevator. Explore the fundamentals of oil painting in a casual yet informative setting with artist/instructor Glenda Blake. Together we’ll paint from a still life in the classroom, learning as we go about composition, under-painting, light, shadow, and color mixing. If you’ve always wanted to paint in oils, now is the time! If you have painting experience already, come to learn new techniques and paint with others. If you have a portable standing-height floor easel you like, feel free to bring it — sitting-height easels are provided by the instructor. Please wear a work apron, and/or older clothing to paint in. Classes are on Mondays, October 19 through November 16. Please plan to attend the first session, and all sessions thereafter if possible. Lessons are sequential; each builds on the previous. To sign up, stop by the circulation desk at Your Home Public Library, 107 Main Street, Johnson City, NY. The second-floor class space is beautiful, but due to the historic nature of the building, there is no elevator. October 3, 2015, 10:00 a.m.-2:30 p.m. Please bring drawing paper, a sheet of graph paper, a 12” ruler, scissors, a glue stick, and crayons (all available at dollar stores). Bring a bag lunch as well. These methods are useable for artwork in all media, but we will not be producing finished works of art in this workshop – leave your paints at home, then use them to better effect after this learning session. When making art, as well as when simply looking at art, we’re always tempted to focus our attention only on the content — the subject of the art — and lose sight of the overall scheme of the picture plane. A painting can be, should be, more than simply a picture of something. Composition is the structure that takes into account all of the elements of a picture and holds them together in one unit, the two-dimensional plan of the canvas. With a few rules of thumb, composition doesn’t have to be complex or difficult, and it can be a major step towards making a “picture of…” into a work of art. I’ll discuss and demonstrate the “rule of three,” the Golden Mean, the concepts of balance, entrance, and exit, and the importance of values. Planning a composition is like solving a puzzle — it can be a great pleasure! 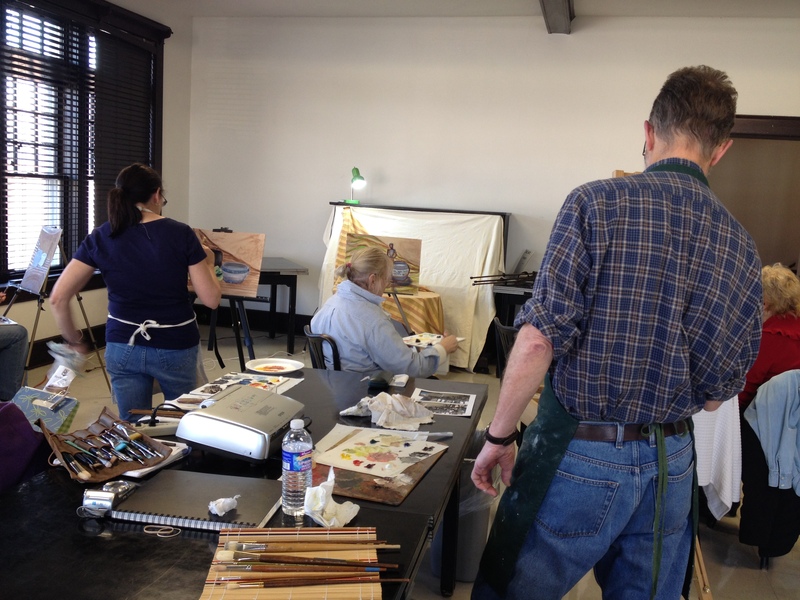 Explore the fundamentals of oil painting in a fun and casual setting with artist/instructor Glenda Blake. Together we’ll paint from a still life in the classroom, learning as we go about composition, under-painting, light, shadow, and color. If you’ve always wanted to paint in oils, now is the time! If you have painting experience already, come to learn new techniques and gain confidence – there’s always something more to learn! Please bring a portable floor easel if you have one (available on loan from the instructor, if you don’t) and a work apron, and/or wear older clothing to paint in. Classes are on Mondays, November 3 through December 1, 1-4:00 p.m. There is a limit of 10 students per class. A one-time $18 fee is required to cover the provided supplies. To sign up, stop by the circulation desk at Your Home Public Library, 107 Main Street, Johnson City, NY. Call YHPL at 607 797-4816 for more information, or contact me. 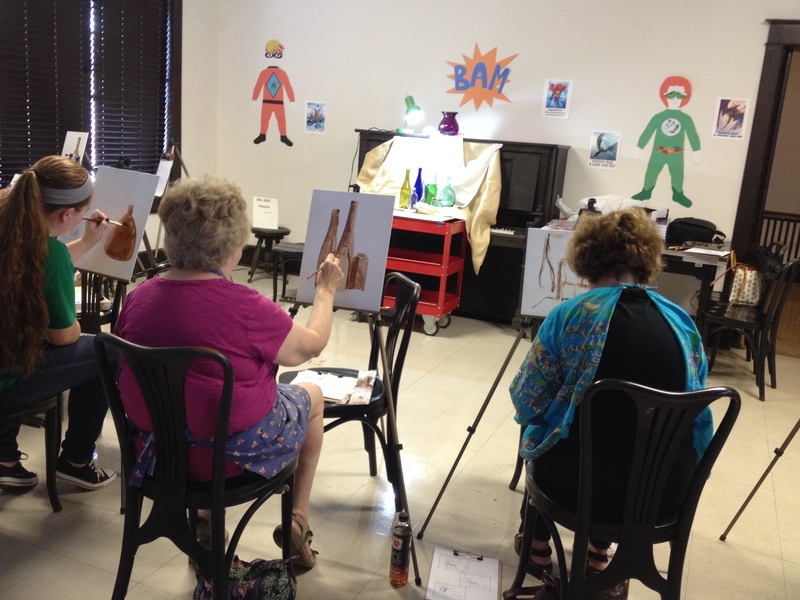 Learn the basics of oil painting in a fun and casual setting with artist Glenda Blake. 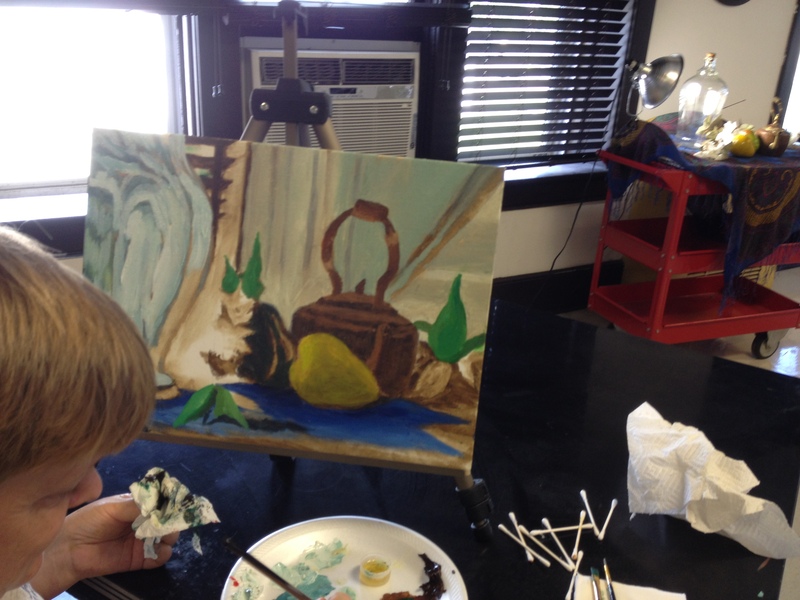 Together we’ll paint from a still life in the classroom, exploring composition, under-painting, light, shadow, and color mixing. If you’ve been puzzled by books on painting, this is an ideal time and place to ask questions. If you’ve always wanted to paint with oils, now is the time! Please bring a work apron and/or wear older clothing to paint in. Classes are on Mondays, July 28 – August 25, 1 – 4:00 p.m. There is a limit of 10 students per class. A one-time $15 fee is required to cover supplies, which are provided. To sign up, stop by the circulation desk at Your Home Public Library, 107 Main Street, Johnson City, NY. Call YHPL at 797-4816 for more information, or contact me. The class space is beautiful, but due to the historic nature of the building, unfortunately not handicapped accessible. Would you like a workshop, class, presentation, or course for your organization? Contact me, and let’s talk about it! Have a suggestion for a topic not listed? Contact me!